These workshops are designed to cover the Earth and Space unit of the Science National Curriculum for year 5. Both workshops use model making and other activities such as using models and lights, as well as photos, films and scientific puzzles. These highly engaging and educational activities will ensure the best possible learning of important scientific concepts. 2. 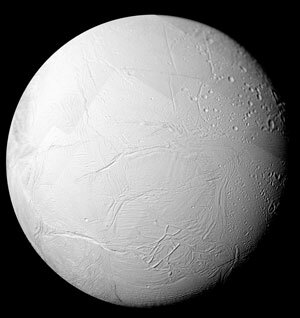 Look at photos and play a variety of games to aid understanding of the scale and other features of the planets and moons. Price: £279 per class for a whole day. Max. 32 children. Fact files about the Solar System - information on all the planets and moons made in the workshop, plus the Sun. These are provided in the workshop for children to make brief presentations and labels for their models. 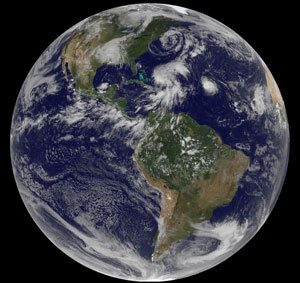 We begin by reviewing the Earth - What is it? How big is it? How does it move? By looking at photos, and acting out motions and sunlight with a globe and a torch, we see how the Earth rotates once every 24 hours and orbits the sun every 365 days. We also learn that the axis is tilted, and that there are warm parts (around the equator) and cold parts (at the poles). We will learn why this is later. Each child now makes a working globe, using a plastic ball, wire, and a card base. They draw the continents on with permanent markers, make holes at the poles with darts, and thread and bend the wire so the model will spin on an axis. 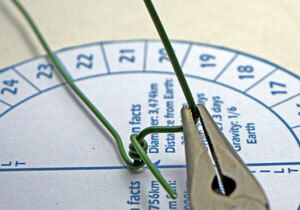 They sellotape the globe to a card base and use a protractor to bend the axis to 23 degrees. Next we consider the Sun: What is it? What is it made of and why does it give us light and heat? To help children understand the size of the Sun (1.4 million km) and its distance from Earth (150 million km) we play games. Children work in small teams (up to 8 teams in all), each of which has a box with balls of various sizes (e.g. beads, marbles, golf balls). In the first game I show children a large beach ball which stands for the Sun (about 46cm diameter). 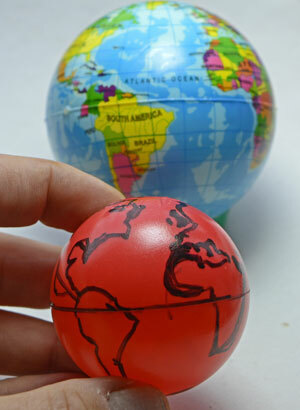 Teams estimate the relative size of Earth, and hold up the correct ball from their box. In this and other games winning teams receive prizes - a luminous star they can put on the wall of their bedroom. In the second game, a golf ball (4cm) stands for the Sun, and all the children estimate how far away the Earth would be at this scale, by getting up and holding a pencil at the correct location in the classroom (the tip of the pencil represents Earth). 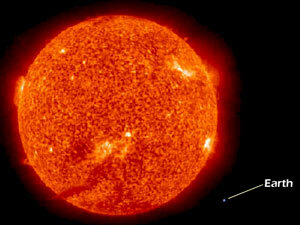 We briefly discuss why the Sun is so important to us on Earth: it provides heat and light without which life would not be possible. We next use the model children have made on a large diagram (an A1 laminated picture - see below). 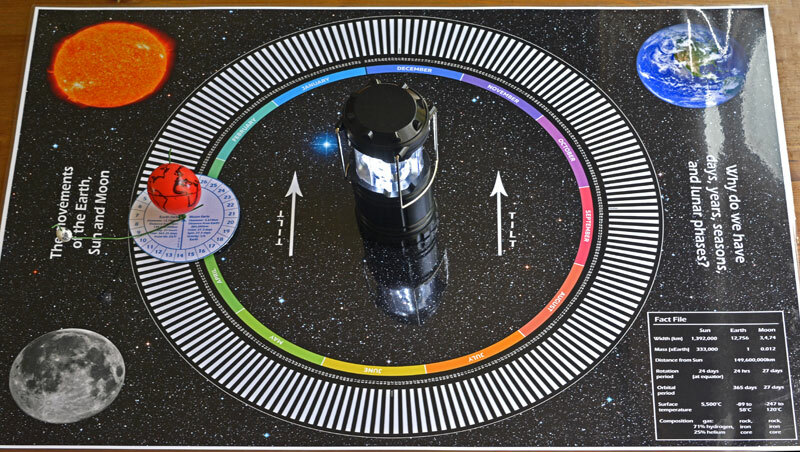 This mat is shared by the team on their tables, with a bright lantern in the centre to represent the Sun. By rotating their globes children see why we have day and night. Also, by moving their globes round the Sun a small amount each day, they see how a year comes about. We now discuss what seasons are, and teams brainstorm why we might have them. I demonstrate the answer first using some children, a torch and models. Next children see the answer for themselves by placing their globes on the diagram at positions which stand for each season, with the globe always tilted in the same direction (shown by the arrows in the photo above). In this way we see how in winter the northern hemisphere is tilted away from the sun, which means less sunlight reaches us (and also the sun has more atmosphere to pass through, which reduces its intensity). In summer we are tilted towards the sun, and so the opposite is true. We also see how the reverse is true for the southern hemisphere. There will be more questions and prizes. To reinforce this idea, children also shine a torch at a card. By tilting the card backwards they see how the area covered by the light increases, so the light is more spread out, and weaker at any one point. I will also show a film I made of the changing seasons in my back garden ( I took one photo per day for a whole year). After lunch we look at the Moon. 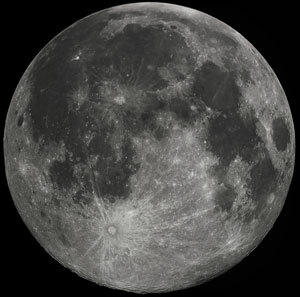 We use photos, lights and models to understand its features, such as craters and mares (the dark parts of the Moon), its composition, and its formation, as well as human exploration. 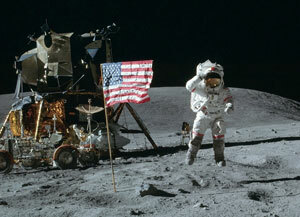 To understand the size of the Moon and its distance from Earth, teams play games using balls, as before with the Earth and Sun. If time allows we will discuss the importance of the Moon: it causes tides, and its gravity stabilises the tilt of the Earth. Both of these may be essential to life on Earth. To understand the phases of the Moon we do a demonstration with some children. We shine a torch on a model and move it around a globe. Working in their teams, children then try this activity themselves. We use a 1.5cm polystyrene ball to represent the Moon. Children draw on some of the features (the dark mares) and poke a hole through with a toothpick. Holding up the Moon each child turns around 360 degrees (in this activity their head represents Earth) while another child shines the torch on the Moon. They will then see the phases of the Moon over its 27-day orbit. Children now place the Moon model onto their globes, so the Moon can orbit the Earth. 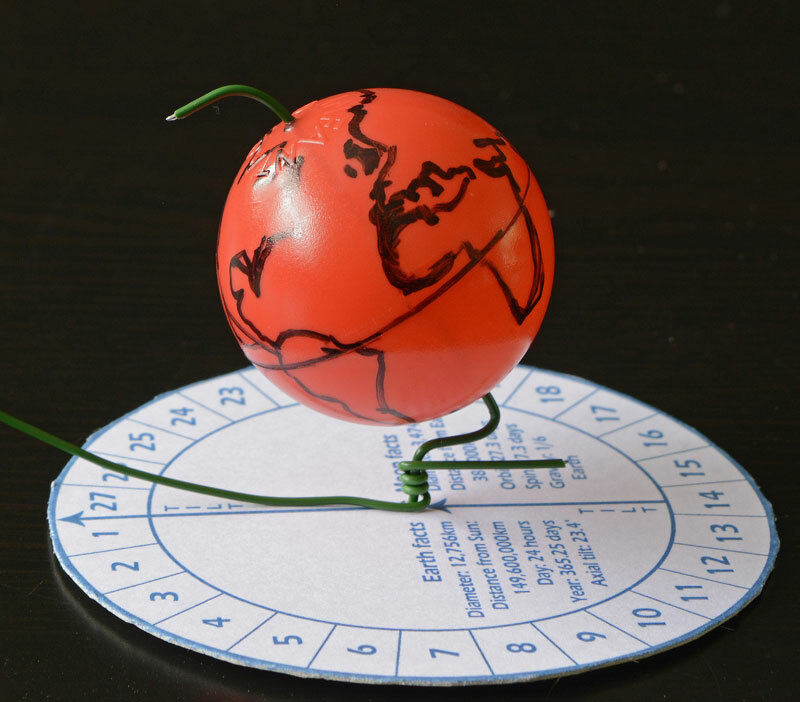 The card is marked with the 27 days of the lunar cycle, so children can see how the Moon revolves round the Earth in 27 days with one Earth spin per day. Chidren place their models on the large mat as before. They can now carry out the full movements of the Earth, Sun and Moon, with the lantern at the centre representing the Sun. 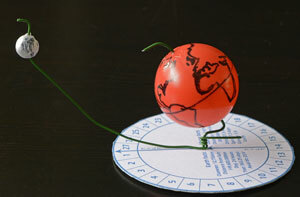 They rotate the Earth once per day, moving it one step around the Sun, and moving the Moon one day at a time. They continue for a whole month to show a full orbit of the Moon with the corresponding 1/12 orbit of the Earth round the Sun. This will consolidate their understanding of the workings of the Earth Sun and Moon system. 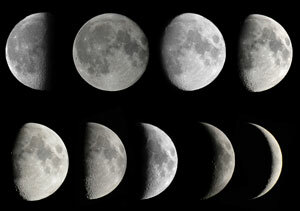 They can also see the phases of the Moon changing as they do this. If any time remains we will finish with a quiz, and I will answer any questions the children have. 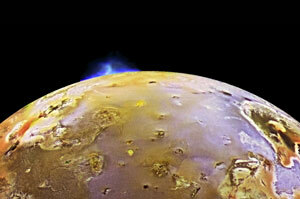 We begin by looking at the origins of Solar System from a spinning cloud of hot gas. In 2018 the first image was taken of a planet forming around a young star. We then take a brief overview of the Solar System, looking at the names and appearance of the planets, what order they are in, and how they move around the Sun. We play a game - can anyone name all the planets in order? (Mercury, Venus, Earth, Mars, Jupiter, Saturn, Uranus, and Neptune; we will also look at Pluto although it is no longer classed as a planet). 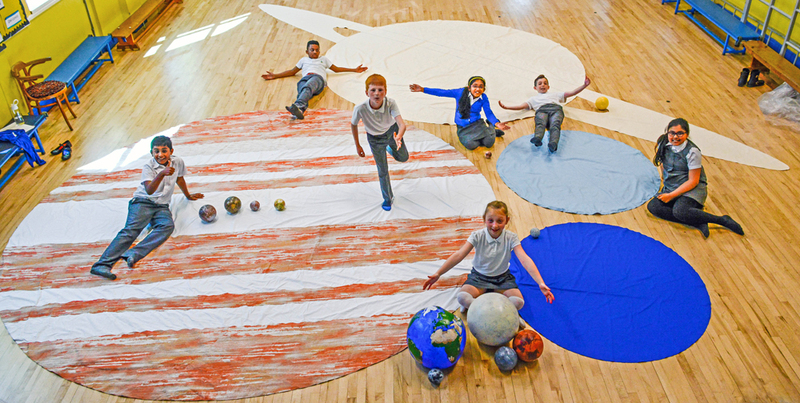 We now take a closer look at each planet, as well as the large moons, using photos and the models which children will later paint to illustrate the relative sizes of these bodies. We discuss some of their most fascinating features, such as the searing temperatures on Venus, the valleys and volcanoes on Mars, the rings of Saturn, and the presence of water and possibly life on Mars, Europa and Enceladus. A number of activities will keep children engaged and help them to understand important concepts. a. To help children understand the scale of the Solar system we play a game. We see a graphic showing the Sun (about 4cm in size) and various possible positions which Mercury might occupy at this scale. Teams select a position, and as before children in the winning team get a luminous star. This activity shows us the enormous size of the Solar System, and the fact that it is difficult to represent all the planets and Sun to scale. b. To help everyone understand the relative distances (but not sizes) of all the planets, two children will stick a labelled picture of each planet on the wall, using a scale of 1cm = 10 million km. This means that the furthest planet from the Sun, Neptune, will be 4.5m away from the Sun on the classroom wall. This activity teaches children that the gaps between the planets increase greatly, the further the planets are from the Sun. 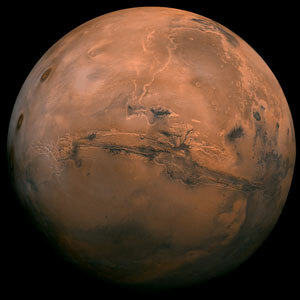 c. We also play an 'Earth or Mars?' 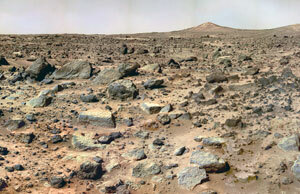 game, in which teams see photos of the surface of Mars and similar desert areas on Earth, and have to decide which planet they show. 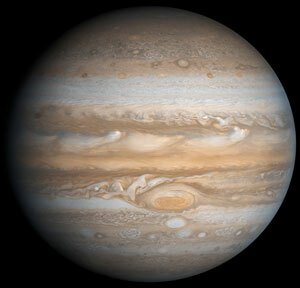 d. To understand the enormous size of Jupiter, I show children the beach ball (46cm) which they will paint later to represent the planet, and teams try to choose the correct ball for Earth from their box (the 4cm golf ball). e. To understand the enormous distance of Neptune from the Sun, children are shown the positions of the Sun and Neptune in the classroom (4.5m apart, at the same scale as our wall display). They then choose the object from their box which represents the size of the Sun at this scale (a tiny 1.5mm bead). For these games children will be allowed to use calculators and/or pen and paper/whiteboard and pen to do their working. Working in small groups or alone, children paint balls of various types and sizes to represent the planets and major moons of the Solar System. Before lunch we will begin by painting background colours on the balls. After lunch we will paint the details. This approach is necessary to allow the background paint time to dry. If anyone finishes painting before lunch they will start preparing a 1-minute presentation on their planet or moon. I will provide balls carefully selected to accurately represent the relative sizes of the planets and moons. These are beach balls and polystyrene balls of many different sizes. I will also provide brushes of various sizes, photo instructions, and 28 acrylic paint colours, most of which I have mixed myself in order for children to be able to paint the planets their true colours. I will also teach children how to paint neatly with the acrylic paint. 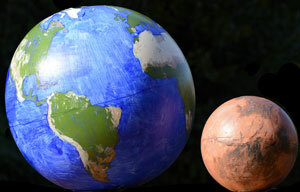 We will make two scale models of the Solar System. The reason for this is that at the smaller scale, we use a 46cm beach ball to represent Jupiter, which means that Earth is only 4cm and Mars is 2cm. This would not allow children to paint the smaller planets in detail. We therefore paint a second set of balls at a much larger scale. At this scale Earth and Venus are 38cm beach balls, and for Mars, Mercury and Pluto we use 20cm, 15cm and 7cm polystyrene balls. This larger scale also allows children to paint the major moons in detail (Ganymede, Callisto, Europa, Io, Titan, Enceladus, Triton, and our own Moon). It is not possible to make the gas giants at the larger scale, as Jupiter would be 4m and Saturn 8m (because of its rings). Instead I will provide my own 2D cloth models (see below) for children to compare with their own painted models. We finish the painting after lunch. Children now give brief presentations on interesting facts about the planet or moon they painted (about 15 presentations in all - children can present in pairs). At the same time we will see all the small scale models. Children hold each model in the correct order. 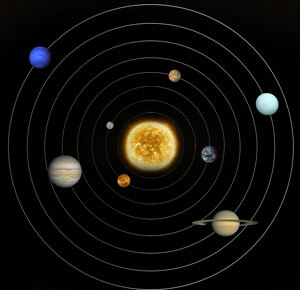 This allows everyone to get a good sense of the relative sizes of the planets and moons. Next we go into your school hall and look first at the large scale model. We lay out my cloth models of the gas giants (Jupiter, Saturn, Uranus and Neptune) and compare them to the children's larger scale models. The enormous size of this model will provide the 'wow' factor you expect from a workshop (Jupiter is 4.2m, Saturn 8.2m, and Uranus and Neptune are about 1.5m). We finish by discussing what we can learn from these models, and a quick quiz for more prizes. For example, in the hall children can stand where they think the Moon should be relative to our larger model of the Earth (answer: 11m away). I will then answer any questions the children may have.